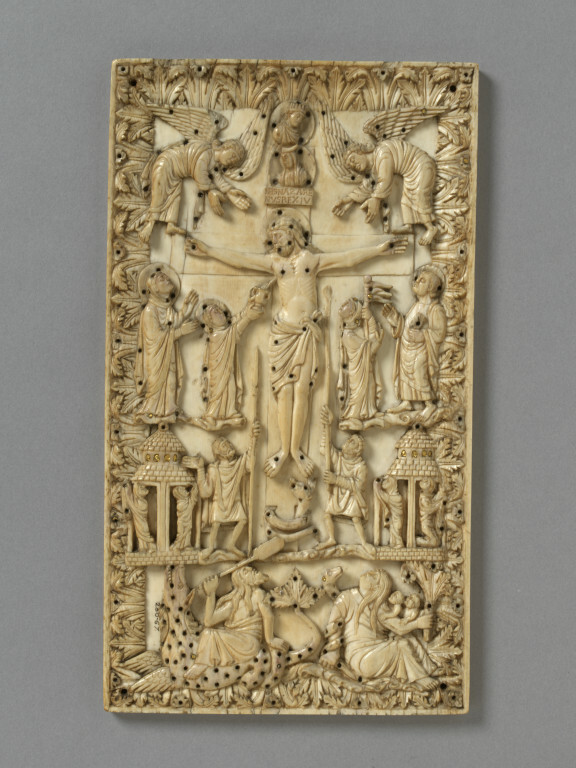 This is one of the series of ivory plaques of the crucifixion produced in the second half of the ninth century, with certain unususal iconographic elements in common. These Crucifixion panels all seem to present an elaborate symbolic image. The serpent wound around the base of the Cross symbolises sin overcome by Christ; Ecclesia catching the blood of Christ refers to the Eucharist, while the resurrection of the dead symbolises the conquest of death and the material world through the Crucifixion. The iconography of these plaques is perhaps derived from the cover of the Pericopes of Henry II in Munich, produced ca. 830-40, a work of the so-called 'Liuthard' ivory group, which takes its name from the scribe who worked on the manuscripts on which some of these ivories were attached. The style of the Crucifixion group -thick set figures swathed in heavy rounded loops of drapery, with square jaws and straight blunt noses - is that of ivories produced at Metz in the second half of the ninth century and the early tenth century. During the ninth century, Metz, in the north-east of the empire, the seat of a bishop, became a very important centre for the production of manuscripts and ivories and enjoyed royal and imperial patronage. It was, together with Tours, Corbie and St Denis in the west, Corvey, St Gall and Fulda in the east, and Milan in the south, the most productive area, particularly in the craft of ivory carving, of the Carolingian empire. The ivories sometimes used classical motifs, such as the personifications of Water and Earth at the bottom of the composition. This luxurious panel was ornamented with gold studs. 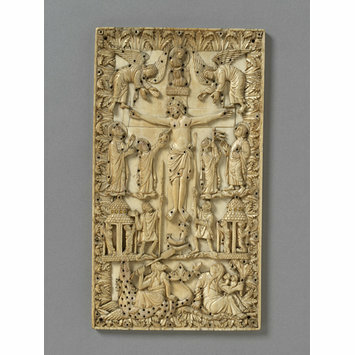 Ivory carved panel depicting the crucifixion with Saints and Angels. Above Christ's head two busts in circles represent the sun and moon, with an angel on each side ready to receive Christ's soul. To the left of Christ are the Virgin and Ecclesia (the Church), the latter holding a chalice to receive Christ's blood, and to the right are St John the Evangelist and the figure of Synagogue, who holds a banner. Below them stand Longinus (with the lance) and Stephaton (with a sponge), with two figures on each side merging from tombs in the shape of circular mausolea: at the bottom are large symbolic representations of Earth and Water. The surface of the relief is dotted with holes which originally held gold studs, some of which remain. 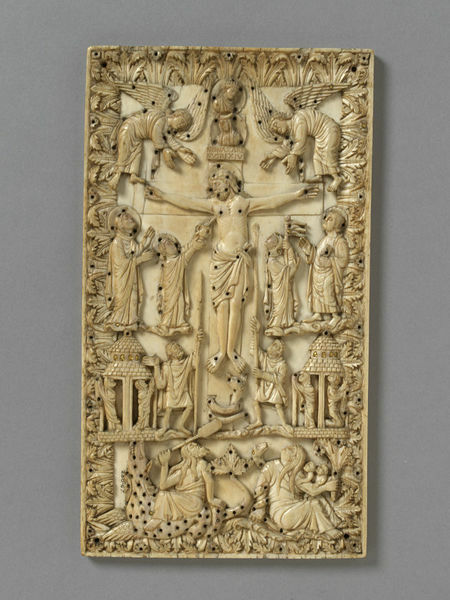 Historical significance: This is one of the series of ivory plaques of the crucifixion produced in the second half of the ninth century, with certain unususal iconographic elements in common. These Crucifixion panels all seem to present an elaborate symbolic image. The serpent wound around the base of the Cross symbolises sin overcome by Christ; Ecclesia catching the blood of Christ refers to the Eucharist, while the resurrection of the dead symbolises the conquest of death and the material world through the Crucifixion. The iconography of these plaques is perhaps derived from the cover of the Pericopes of Henry II in Munich, produced ca. 830-40, a work of the so-called 'Liuthard' ivory group, which takes its name from the scribe who worked on the manuscripts on which some of these ivories were attached. During the ninth century, Metz, in the north-east of the empire, the seat of a bishop, became a very important centre and enjoyed royal and imperial patronage. It was, together with Tours, Corbie and St Denis in the west, Corvey, St Gall and Fulda in the east, and Milan in the south, the most productive area, particularly in the craft of ivory carving, of the Carolingian empire. The relief was believed to be from the cover of a book of the Gospels in the Cathedral of Verdun. But this has to be rejected due to different facts. It very likely has been another plaque albeit virtually identical. Inventory of Art Objects acquired in the Year 1867. Inventory of the Objects in the Art Division of the Museum at South Kensington, arranged According to the Dates of their Acquisition. Vol. 1. London: Printed by George E. Eyre and William Spottiswoode for H.M.S.O., 1868., p. 9.